WATCH | Communist icon Vladimir Lenin's statue pulled down by BJP workers in Tripura - Integration Through Media ....! 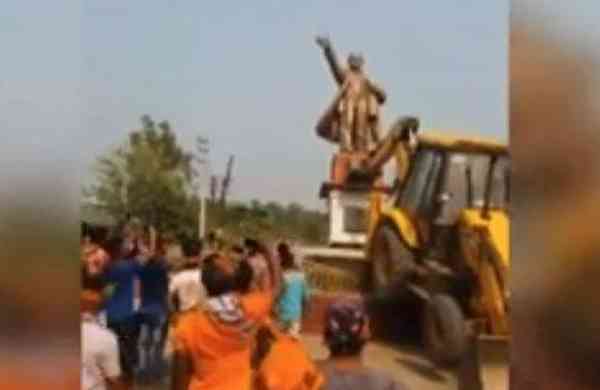 AGARTALA: Two statues of communist icon Vladimir Lenin were brought down in South Tripura, the police said today, as the CPI(M) and its arch-rival in Bengal, the Trinamool Congress, blamed the BJP for the incidents. The statues were pulled down just days after the Left was defeated in Assembly polls by the BJP and its ally IPFT, which together won a two-third majority in the House in a state where the CPI(M) was in power for 25 years. A five-foot-high fibreglass statue of Lenin was toppled at Belonia yesterday, while a smaller figure was razed at Sabroom two days ago, district superintendent of police Monchak Ipper said. Tripura chief minister-designate Biplab Deb has urged the people of the state to maintain peace and said anybody indulging in violence would be punished. Union Home Minister Rajnath Singh spoke to state Governor Tathagatha Roy and the director general of police, asking them to ensure peace till a new government was installed, an official said in New Delhi. The demolition at Belonia evoked a sharp reaction from Trinamool Congress chief and Mamata Banerjee, who blamed the BJP and the RSS for the incidents. Tripura CPI(M) district secretary Tapas Datta alleged that the statue, unveiled by the party's Politburo member and former general secretary Prakash Karat a few months ago, was razed by BJP workers yesterday at College Square in Belonia, about 110km from here. “After pulling down the statue, slogans of 'Bharat Mata Ki Jai' were raised,'' Datta told PTI. Ipper said the driver of the JCB excavator machine allegedly used to bring down the Lenin figure at Belonia was arrested and a notice sent to its owner. The statue would be handed over to the authorities of the Belonia Municipal Corporation, he said. The incidents took a controversial turn with a tweet posted by Governor Roy. ''What one democratically elected government can do another democratically elected government can undo. And vice versa'', he tweeted. CPI(M) general secretary Sitaram Yechury, who criticised the incidents, described the tweet as “unfortunate”. ''The tweet by the governor is unfortunate. This shows how constitutional posts are being undermined,” he said. Asked by a TV news channel for his comment, Roy said, “'Yechury may go on making charges. It is not my duty to reply. 'Prohibitory orders were clamped on several areas of West Tripura district including – Srinagar, Lefunga, Mandai, Amtali, Radhapur, Arundhatinagar, Jirania, Mohanpur following post-poll violence, district magistrate Milind Ramteke said. The CPI(M) accused the BJP and the IPFT of unleashing an “unprecedented reign of terror” across the state after the election results were announced on March 3. Yechury alleged in Kolkata that 514 party activists have been assaulted, 1,539 houses of party activists attacked and 196 houses set ablaze in the last few days. He also claimed 134 CPI(M) offices were attacked and looted, 64 party offices set on fire and 90 offices of mass organisations occupied by BJP-IPFT supporters. The party top brass including Yechury and Politburo members Prakash Karat, Brinda Karat and Surjya Kanta Mishra led a rally in Kolkata, which ended in front of a statue of Lenin at Dharmatalla in the heart of the city. Tripura CPI(M) state secretary Bijan Dhar appealed to the state administration and the BJP to “stop the violence”. ''In a democratic system a change of government is usual, but violence in such a grave form is not acceptable,” he said. The police today said it had received complaints of post-poll violence from various parts of the state since Sunday night. Senior CPI leader D Raja said while one party may win and another party lose an election, it did not mean either could indulge in vandalism. ''Lenin is considered one of the tallest leaders of the world. We should have that respect,'' he told a TV news channel. West Bengal Chief Minister Mamata Banerjee slammed the RSS-BJP for their alleged involvement in the pulling down of Lenin's statues. “It is not one's job to pull down the statue of an icon after coming to power in a state,” she said at a public meeting in Bankura in West Bengal. Tripura's BJP vice-president Subal Bhowmick had alleged yesterday that CPI(M) activists assaulted 49 BJP supporters, 17 of whom had to be hospitalised.